More standard features economically priced to meet your needs and your budget! 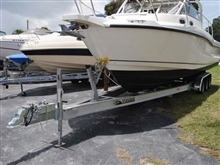 Keep your investment in your boat by protecting it while you travel with your boat or while keeping your boat in storage with our Seahawk Trailers. 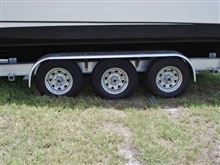 No matter the distance, boat ramp or the roads you travel, the Seahawk trailers from Boat America in St Peterburg, Florida come with a warranty you can count on. Ask about options and features for your boat or jet ski. Our trailers can fit any boat style, size or type. Call Boat America today at 727-344-2628 or Email Us at Boat America for a Free Quote on a Boat or Yacht Trailer! Aluminum I-Beam Construction * Stainless Steel Main Frame Bolts * Front Center Bunks * Heavy Duty Marine Grade Carpeted Bunks * Heavy Duty Stepable Aluminum Diamond Plate Fenders * Submersible Lights * Step Hull Capacity * Galvanized Spoke Steel Wheels * 1,200 lb Tongue Jack with Caster Wheel* (**10,000 lbs & below) * Galvanized Adjustable Winch Stand with 2,500 lb Winch & 10,000 lb Strap* (*over 6,000 lbs) * 5 Year Axle & Hub Warranty * Lifetime Limited Warranty on Frame. This warranty does not include damage caused by abuse, negligence, lack of maintenance, improper loading or use, any consequential damage, loss of time, inconvenience, loss or damage to personal property; lights and associated wiring, or tires (covered by the manufacturer). 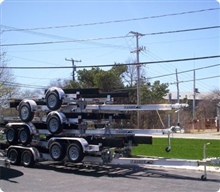 SEAHAWK Aluminum Boat Trailers warrants its trailers, less any exclusions listed above, to be free from defects either in material or workmanship. 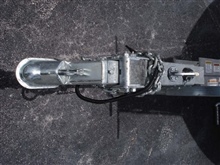 Any part of the trailer will be replaced at no charge for labor or parts when returned to the factory or its designated distributors at owner's expense. 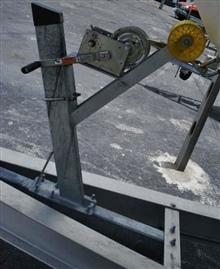 Within 15 days of the discovery of any defect, the owner must notify SEAHAWK Aluminum Boat Trailers for authorization of warranty repairs. Some models shown with optional features. SEAHAWK reserves the right to make changes, additions or deletions to all of its products and components without notice.